Miru 1 Month are monthly, silicone-hydrogel contact lenses made with Menicon's patented MeniSilk and Nanogloss technologies. They provide optimal comfort and sharp sight for one month. This package contains one 360ml bottle of Gelone solution and an antibacterial lens case. 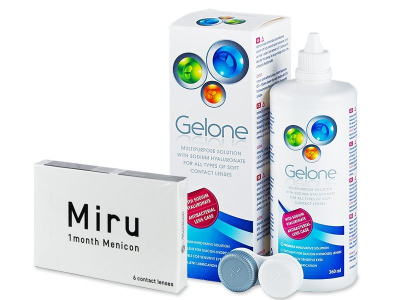 Miru 1 Month are silicone-hydrogel contact lenses made by Menicon using their advanced, dual technologies, MeniSilk and Nanaglos. These technologies provide exceptional comfort and clarity of vision for one month of wear. Miru 1 Month are made from a silicone-hydrogel material called Asmofilcon A, which has a very high level of oxygen transferability (Dk/t 161). The extremely thin edges of the lens minimise friction for even greater comfort.